Six of us with the Ocrafolk School Sampler Class made an excursion to Portsmouth Island yesterday afternoon. It wasn't sunny and bright, but it wasn't raining and cold either. Luckily, it was windy. If you've ever been to Portsmouth Island, you know what I'm saying. As long as I stayed out of the grass and in the wind, there probably were not more than 3 or 4 dozen mosquitoes on me. I kept a myrtle branch swishing around myself the whole time. When the Park Ranger came by to talk to us about island history, I thought fast and told him that I brought the myrtle branch from Ocracoke. He just gave me a knowing smile. The class concentrated on learning about island architecture and history. Portsmouth has been a ghost town since 1971. We explored several abandoned but preserved NPS buildings including the US Lifesaving Station, US Post Office, schoolhouse, Methodist Church and a number of residences. The Park Service is in the process of replacing all the historical displays. Among other things, by next Spring the Life Saving Station will include a surfboat reproduction, beach cart, Lyle Gun, and other breeches buoy rescue apparatus. If you've never been to Portsmouth, consider making a trip over there on your next visit to Ocracoke. It is a unique part of our Outer Banks heritage. Our latest Ocracoke Newsletter is a transcript of a letter written in 1949 by a visitor to the island. You can read the letter (which provides a glimpse into Ocracoke life sixty years ago) here: http://www.villagecraftsmen.com/news102509.htm. Every time I paddle out into Pamlico Sound I think, "I ought to do this more often!" Yesterday afternoon I joined five friends for a little adventure exploring the sound shore. Although we didn't see many birds, we did spot an osprey, a kingfisher, and a great blue heron, as well as gulls, cormorants, and pelicans. Unfortunately, we also saw an extremely weakened loon that had ventured into the marsh grass to die. When we came back it was no longer breathing. The wind was very light yesterday, and the rain had finally stopped. The temperature was in the mid-60s...just perfect for paddling. Even the water wasn't cold...at least not for wading. We had a great time...and worked up a hearty appetite. I slept like a baby. Kayaking is a wonderful way to see the island from a different perspective. And it's a delightful and peaceful way to spend a lazy afternoon. The third annual OcraFolk School got underway Sunday evening with a dinner at the Pony Island Restaurant. After dinner members of each class gathered around tables to introduce themselves, meet their instructors, and get a brief overview of the week's activities. Yesterday began with breakfast at the Flying Melon Restaurant. Afterwords, participants were divided into two groups for an introduction to Ocracoke. Each group spent one half of the morning at the Preservation Society Museum with me, and the other half of the morning with Captain Rob Temple learning about seafaring and sailing traditions. Classes started in earnest at 1:30, and lasted until 5:30. In spite of the rainy weather everyone seemed to be excited about being on the island and ready to learn new skills. Classes continue every morning and afternoon through Thursday. Wrap-up is Friday morning. For more information and photos from past schools, please click here. We have just published our latest Ocracoke Newsletter, a letter written by C. A. Weslager after a visit to Ocracoke Island in 1949. This correspondence is a brief glimpse into the life of Ocracoke sixty years ago, from the point of view of a first time visitor. Van O'Neal & I decided to grade Howard Street yesterday afternoon. The pot holes were getting deeper. It was time to fill them in. I have a substantial three-blade grading trailer; Van has a powerhouse of a truck. Together they would do the job. I sat on the back, operating the controls; Van drove. Half way through the operation the heavens opened up and I was quickly soaked. Since I was already wet we continued to straighten out the road. It's now much better than it has been, but a few dips still fill with water when it rains. I guess we'll wait a while and then do it again. In the meanwhile, drive slowly down Howard Street, especially if it's wet. Please don't splash through the puddles and make them deeper. Friday morning at 11 am about 150 people gathered on the lawn of the Preservation Society museum for a ceremony honoring the WWII Navy cover and deception unit (the Beach Jumpers) which trained on the island from December, 1943 through January, 1946. This was a top secret organization. Islanders knew nothing about the operations of the Beach Jumpers. Only now are details of their mission coming to light. Ocracoke was chosen for the Beach Jumper's base because of the island's remote location. During and immediately after the war Ocracoke was only accessible by mailboat, private boat, or plane. I stepped out into my back yard yesterday and a strong odor of fish assaulted my senses. Or maybe it was shrimp or crab shells. Surely, I thought, a neighbor had enjoyed a seafood feast days before and hadn't properly discarded the leftovers. Late in the day I discovered the source of the odor. A school of menhaden had apparently found their way into the harbor. Menhaden are oily and smelly fish, and it seems they attracted a school of dolphins. I missed the spectacle, but I was told that it was quite a sight watching the dolphins pursue the menhaden. Jaren Cullen took this photo. She was trying to catch the turbulence on the surface of the water, but it's not apparent from this distance. Regardless, I thought our readers would enjoy a view of Silver Lake Harbor (without the odor). In stark contrast to Monday's turbulent ocean and exceptionally high tides, yesterday's Atlantic was as calm as a lake. Gentle waves lapped the shore with hardly a hint of white. Anglers were strung out along the beach about as far as I could see but the only fish brought in was a skate. A few people were throwing cast nets into the water. Others were perched in lawn chairs enjoying the sun, and reading. It was a tad chilly for swimming. We looked for dolphin, fully expecting to see some (the conditions just seemed right), but we were disappointed. Some of the fishermen said they had spied a number, though. A reader recently asked about renovations and repairs to the lighthouse. I have seen some evidence of work being done at the lighthouse, but was off-island for more than a week, so I'm not up to date about the progress. Apparently the light is still on. I'm guessing the workers will turn it off only when they need to in order to do their work. Another reader asked about the Ocracoke Preservation Society auction. The annual membership meeting is Tuesday, November 10, and the auction will be conducted after the pot luck dinner and meeting. There are just a small number of items to be auctioned, and you can read about them here: http://www.villagecraftsmen.com/auction.doc. One reader asked about bike paths on the island. For the last couple of years we've had a narrow concrete "sidewalk" installed adjacent to the main road through the village, and bikes sometimes use that. However, in the summer months cars and trucks must share our roads with bikes, pedestrians, strollers, skate boards, motorcycles, and eighteen wheelers. As I write, the state of NC is building a wide bike path from the NPS campground to the village. A narrower extension to the road has already been laid down from the campground to the pony pen. One other reader asked about Loop Shack Hill. The hill, the site of the Navy's WWII radar tower, is on NPS property. Take NC Hwy 12 north, out of the village. Go just a short distance past Howard's Pub and a private house at the edge of the village. You will see a hill on the sound side of the road. If I'm not mistaken, there is speed limit sign there, by the road. Walk up the hill and you will find the base of the radar tower, overgrown with cedars. On the other side of the hill are the remnants of the concrete block communications buildings, rusted remains of other towers, etc. Keep two things in mind: 1.) This is NPS property, so please do not disturb artifacts, or remove any property (many of us hope that some day the Park Service will recognize this site as historically important), and 2.) The area is often covered with Prickly Pear Cactus. You have been warned! Amy had a dental appointment yesterday (in Nags Head), and she asked me if I'd like to ride along. I did, which helps explain why I didn't post on the journal yesterday. We left at 7:30 a.m. and arrived back home at 9:00 p.m. I didn't realize that the tide was so high. The ocean was washing over the road a mile or so before we got to Hatteras Inlet. Strong winds added to the effect, which made the morning ferry ride quite an adventure! After we left the protection of the basin, almost immediately small choppy waves began splashing up over the bow of the vessel. Salt spray was driven onto the cars on the starboard side of the boat. In the inlet the situation got more exciting. We plowed through rough seas that sent seawater climbing over the bow, cascading across the open deck, and washing out through the scuppers. Several large waves sent frothing, foaming spray as high as five feet over the tops of the webbed barrier at the bow of the boat. What a sight! There was no danger. The ferry hardly rolled at all. It was simply the direction of the wind, the flow of the tide, and the course of the vessel that combined to create the excitement. The return was so different. The setting sun set the western horizon ablaze in color. The sound was placid. The ferry ride, calm and serene. It was good to be back home. Friday night I was engaged in an Ocracoke Preservation Society executive committee meeting when DeAnna reminded me that I had agreed to act as auctioneer for a sale of island artifacts after our upcoming general membership meeting. "Oh no," I blurted out, "I made a mistake. I can't be there that night." After the meeting another member commented that Charles Temple would make a great auctioneer. I decided to call him right away as I rode my bicycle back home. It was an easy request to make. I know Charles has the necessary skills, is committed to community involvement, and would get an adrenaline rush coaxing ever higher bids from his neighbors and friends. I was right. He was interested immediately. "What day of the week is the meeting?" he asked. "I think it's a Friday, but I don't have a calendar in front of me," I answered, "I'm on my bike." Just then I was approaching the curve in the road near Captain's Cargo. An SUV with bright lights drove up close behind me. At the same moment I heard Charles complain that oncoming headlights were blinding him. As the truck passed me I noticed a bicycle traveling in the other direction, across the street. The rider had a cell phone up to his ear. He wheeled around and we finished our conversation face to face (after a good deal of laughter and talk of "only-on-Ocracoke"...and a mutual agreement that this was a perfect subject for my blog!). I am sorry to report that Ann Scarborough, who just celebrated her 100th birthday on October 5, died three days ago, after a fall. Ann was a woman who not only enjoyed sharing detailed stories of her early encounters with Ocracoke (she married island native Alton Scarborough in 1931), but kept up with current island and national events. We will all miss her. This afternoon Beth Hotchkiss and Greg Husted will exchange vows on the lawn of the former Myra & Stanley Wahab property. Beth and her extended family have had homes on the island for more than half a century. We wish for Beth & Greg long lives filled with love and happiness. Yesterday, on RockyMountTelegram.com, I read the announcement reproduced below. Debbie Kornegay, for whom Debbie's Fund is named, was killed two years ago in Rocky Mount, NC, the victim of a senseless act of random violence. She was a part-time island resident and Ocracoke homeowner. If you live in or near Rocky Mount please consider attending the Art Show & Auction. Your purchases will benefit community organizations in both Rocky Mount and Ocracoke, and will honor a special woman and friend of Ocracoke who died while serving others. Debbie’s Fund will sponsor its second annual Art Show and Auction on Saturday [October 17] at Historic Stonewall Manor. The event will include a silent auction from 10 a.m. to 3 p.m. and a live auction from 3:30 to 5 p.m. Nearly 100 pieces of art will be for sale, including paintings, jewelry, pottery and other art forms. Debbie’s Fund is a nonprofit organization that raises funds for charities in Rocky Mount and Ocracoke Island in memory of Debbie Kornegay, the slain former director of Meals on Wheels. The organization last year donated $10,000 to Braswell Memorial Library, the Christian Fellowship Homes, the Ocracoke Volunteer Fire Department and the Ocracoke Child Care Center. Sometimes journalists, newscasters, and others will describe Ocracoke as a "resort community." It is not. Ocracoke is a year-round community of nearly 800 citizens...citizens, to be sure, who are accustomed to welcoming visitors, especially in the summer season. However, we work together as a community throughout the year to ensure that our children are well educated, that our families and neighbors are supported, that our property is protected, that our needs are communicated to elected officials, and so forth. Tomorrow, Friday, October 16, Ocracoke Child Care is sponsoring a fund raiser. They are offering chicken barbecue and baked goods at the Community Center from 4:30 until they run out of food. I can't remember the cost, but whatever it is, it will be a bargain (and will help support Ocracoke Child Care). So, whether you are a year-round member of this community, or a visitor, come on out to the Community Center tomorrow for good food...and a good cause. "It was like manna from heaven when the vessel 'Pioneer,' a heavily loaded wooden freight steamer, was wrecked off Ocracoke in a violent storm back in August, 1920 [actually it was October 14, 1889, as I know for certain from my great-grandfather's shipwreck report, and from other reliable sources]. Everything from Bibles to cabbages floated ashore. Hams, bananas, barrels of flour, casks of alcohol, bladders filled with snuff and a great deal of canned food came into the Island, which was flooded by the tide, and everywhere folks were knee-deep in water sweeping up valuable debris as things washed by them. One old fellow threw away his old shoes when he spied a new pair drifting toward him, only to find the new ones were both for the same foot. One woman gathered up enough bladders of snuff to fill a barrel which she proudly kept upstairs in her house for all to marvel at. She happily contemplated a future with a plenteous supply of snuff. The entire crew of the 'Pioneer' was saved, and they joined the islanders in rescuing the cargo. 'Come on over to my house--there's plenty to eat' was the cry of the generous native to any stranger around, for the wrecked cargo had yielded more than enough to supply the island with a day's rations. The late Theodore S. Meekins, prominent Manteo real estate and insurance man, saw the wreck of the 'Pioneer' and remembered these incidents concerning it. He believed the 'Pioneer' was the last wooden steam vessel seen in these parts, and when it hit it went into pieces and sank almost immediately. The ship struck during the daytime and was plainly visible from the shore. The observers on shore could see the boat break into pieces and disappear into a raging sea. Mr. Meekins recalled the auction held in connection with that part of the cargo not taken by the natives during the storm. There were only two magistrates on Ocracoke and both were fighting each other for the privilege of selling the cargo. A 50-gallon container of alcohol to be auctioned off had been considerably decreased by the frequent visits of natives down to take a little drink or two. Finally, a few days before the auction, Captain Jim Howard stopped them by planting himself firmly on top of the barrel and guarding it with his life. When the barrel was brought up for sale at the auction Captain Jim was astride it, and he was sold with the barrel. He bought it himself for five dollars. So keen was the auction that one barrel of flour brought six dollars. And after the sale the strangers who had come down to Ocracoke for the auction were treated grandly by the natives before time to depart." During WWII the US Navy built a base on Ocracoke Island (where the NPS Visitors Center is located today). This naval base effectively ended the U-boat attacks that, early in 1942, sank more than 75 vessels off the North Carolina coast. During the war Ocracoke was also used by the US Navy Beach Jumpers, a tactical cover and deception unit which was organized under Admiral H. K. Hewitt, then Commander of Amphibious Forces, and of all U.S. Naval Forces in Northwest African waters and the Western Mediterranean. The Beach Jumpers were the forerunners of the Navy Seals. Next Friday, October 23, the Beach Jumpers Association will dedicate a marker near Loop Shack Hill (site of the first radar tower on the east coast). Members of the Association will be arriving on Thursday for meetings and socializing, as well as for the dedication. The dedication is open to the public. Over the weekend there was much activity here on Ocracoke. Several couples were married, including our very own William & Jesse Howard. In typical island fashion their wedding was outdoors and rather informal. Emily & Andrew ("Mandolin Orange") played for the ceremony and the reception, wine glasses were raised in toasts, plates were piled high with southern foods, and laughter and convivial conversation abounded. We wish William & Jesse all the best! On Saturday night Tony Trishka, considered one of the world's foremost banjo players, entertained a full house at Deepwater Theater. Two hours of banjo music? you might ask. He received a standing ovation. Yesterday afternoon forty international military students toured the island and the Preservation Museum. They hailed from all over the world -- The Czech Republic, Sudan, Egypt, Indonesia, Jordan, Lithuania, Liberia, Poland...to name just a few of their countries. This morning it's partly cloudy, the temperature is about 70 degrees, and there's a chance of rain later today. 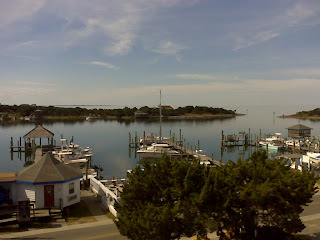 Visitors to Ocracoke often ask residents where we go for vacation. Almost every fall I travel to East Tennessee to hike in the Great Smokey Mountains. For more than twenty-five years I have met friends there, and we hike to the top of Mt. LeConte. At the summit is a log cabin lodge where we spend the night. The only way to get to the lodge is by walking one of five trails (each one is from 5 to 9 miles long). This year I took the Rainbow Falls Trail (6.6 miles with an elevation gain of about 4,000 feet) which passes the highest water drop in the Great Smokey Mountains National Park. Mt. LeConte is more than 6,000 feet high, but this islander (who lives at a mere 4 feet above sea level) manages the trek up with little difficulty (but the descent this year gave my lower back a fit!). I just returned home last night. The weather was great, though skies were cloudy at the top, so there were no spectacular mountain views this year. Today is the one hundred and seventy-second anniversary of the worst sea disaster ever to occur on the North Carolina coast. On October 9, 1837 the steamship "Home" wrecked on Ocracoke beach with the loss of ninety lives, many of them passengers (men, women, and children) traveling from New York City to Charleston, SC. According to news sources, the state of North Carolina has signed a contract for a new ferry to serve the Ocracoke-Cedar Island and Ocracoke-Swan Quarter routes. The new vessel will be 220 feet long, by 50 feet wide, and will be able to carry up to 50 cars and 300 passengers. Work may begin as early as later this month, and is expected to be completed by May, 2011. This Saturday, October 10 Tony Trischka, one of the world's top five-string banjo players, will be holding a workshop on Ocracoke Island. Designed for intermediate to advanced players, this day long event will culminate with a 7:30 pm concert at Deepwater Theater. If you will be on the island this coming weekend be sure to attend the concert. This will be a treat for anyone who enjoys traditional bluegrass music. The third annual OcraFolk School is almost upon us. The dates are October 25 - 30, the last week of the month. There are still a couple of spaces available in the Ocracoke Sampler class...an opportunity to immerse yourself in a bit of island history, sail aboard the schooner Windfall (and participate in old-time seafaring traditions), kayak on Pamlico Sound (and maybe even gather enough clams for a meal), and walk across the island from ocean to sound, leaning about the unique ecology of this very special barrier island. Happy Birthday Ann Scarborough! Ann is 100 years old today, and just as sharp as ever. She lives with her son Al, and his wife Linda. She can tell you all about Ocracoke before paved roads and ferries...and she'll also let you know what she thinks about current events. Al & Linda are hosting an open house today, so stop by and wish Ann a very happy birthday. Members of the Society, as well as residents and friends of Ocracoke were delighted with the bequest. The Society is actively working to put the money to good use to save and protect significant island structures. We will be sharing more information as it becomes available. What spectacular weather we've been having lately! We've been outside as much as possible. Yesterday Amy and I took Lachlan and his bicycle down to the NPS campground. It's the perfect place for a new rider. The campground is only about a quarter full, and most of the campers were on the beach. So the pavement was wide open for Lachlan to cruise around the circles...again, and again. and again. He's even perfecting his dismount (he likes inspecting the skid marks! ), but he has trouble getting started without a little help. Before we headed back home we walked across to the beach. Some of the waves were of medium height, but they all were gentle. No crashing, angry tumblers...just mildly rolling undulations. And the water was so clear you could see seashells on the bottom. Lachlan and I had a wonderful time, but after a while we reluctantly got out of the water and trudged off with mama, hand in hand, back to the car. Last night, after our last Opry of this season, Wes Lassiter told us that he'd discovered a You Tube posting of portions of the September 16 Opry performance.